That was a peculiar performance by Cape Breton Regional Municipality Mayor Cecil Clarke Friday. At a hastily called, 3:30 p.m. news conference, the mayor denounced municipal affairs bureaucrats for piling $4-5 million in new charges onto the financially strapped municipality, while rejecting his reasoned pleas for help coping with CBRM’s fiscal mess. Since his election in the fall of 2012, Clarke has quietly led CBRM officials and citizens through a deliberate process to identify efficiencies in the municipality’s far flung operations. They pared capital spending, and made what appeared to be an honest effort to come to provincial (and federal) negotiations with clean hands. Then, just as council was headed into budget discussions, the province downloaded $4-5 million in new costs for education, housing, corrections, lower payments-in-lieu by NS Power, and an actual reduction in equalization payments. Clarke’s timing was impulsive. Friday afternoon is when governments make announcements they hope will slide by with little notice. His worship arrived home from a meeting with Municipal Relations officials in such high dudgeon, he refused to wait for a more effective time to communicate his outrage. Clarke did his best to walk an improbable line between arrogant, uncaring bureaucrats on the one hand, and a kindly, well-meaning minister, who will surely do the right thing once he receives the correct information his staff has been withholding from him, on the other. It was a seasoned pol’s thinly plausible way to ream out the province, while leaving the politicians in charge room to compromise. Clarke’s credibility was undercut by his failure, earlier in the week, to raise even a mild protest against the Harper Government’s elimination of a development agency dedicated to Cape Breton. ECBC and its predecessors have pumped tens of millions a year into Cape Breton’s economy for 46 years. 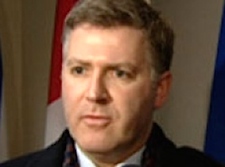 A former candidate for the Harper Conservatives (who has promised not to run in the next federal election), Clarke all but cheered the closure, thereby making the feds’ adroit communications strategy that much easier. No doubt he believed himself powerless to avert the closure, and chose to keep his warm relations with the federal Conservatives intact. But to date, Clarke’s attempts to parlay his relationship with PM Stephen Harper and NS Political Minister Peter MacKay into anything useful for CBRM have failed. All this might make it easy for Furey and Premier Stephen McNeil to dismiss Clarke’s angry news conference. They would be imprudent to do so. For 12 years—12 lost years—CBRM suffered under a mayor whose policy program consisted of a fantasy container pier and continual, childish attacks on the province. He portrayed Cape Bretoners as helpless in the face of cruel and manifestly unfair treatment at the hands of our rich Halifax cousins. It was humiliating and counterproductive. Clarke campaigned against that style of government, and he has done everything the province could ask to put CBRM back on a constructive path to responsible government. Do McNeil and Furey really want to create another John Morgan? No doubt Clarke could play that role. In fact, he’d be good at it—far better than the pathological Morgan. That would be a destructive outcome for the municipality and the province. It’s time for McNeil and Furey to come to the table and negotiate a serious, concerted, cooperative effort to resolve CBRM’s budgetary crisis.